Thatching, sometimes also known as dethatching, can help improve your lawn’s health and give you the luscious lawn you want this spring. Thatch can be a serious lawn care problem and is, simply, a layer of living and dead organic matter; this mainly contains turf grass stems and roots that build up faster than nature can break them down. To avoid this, you can take preventative measures in protecting your lawn or if the damage has already been done, thatching your lawn is a great option. Thatching removes the dead layer of roots and stems that is found between the soil and grass. The thatch, when it is thicker than a half-inch, can prevent the absorption of oxygen, water, and other nutrients to the grass roots. Thatching is usually performed in the spring or fall by using power equipment when performing a lawn aeration. Thatching is much more stressful on the ground than lawn aeration and is usually performed if your lawn is thinning out due to thatch. That's why Weed Pro recommends a core aeration, as opposed to strictly thatching. A core aeration can be extremely beneficial, because it creates thousands of pockets in your soil AND reduces the thatch layer. Help expose your soil to warmth and sunlight- This ensures healthy lawn after the harsh and cold Ohio winter. Healthy Root Growth of Your Grass- With a buildup of thatch, your roots will never be healthy. Without healthy roots, your lawn will never be green, full and thick. Dethatching helps to circulate air deep down into the roots and provide the necessary carbon dioxide, stimulating existing roots while encouraging new root growth. Fertilizer Will Become More Effective- Removing thatch helps fertilizer to blend more properly with the soil and spread throughout the lawn. Effective Draining- Thatch on the lawn blocks the drainage of water from the top of the grass to the roots. 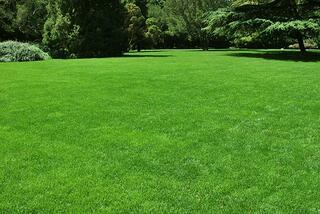 With a healthy lawn, water only remains above ground for a short period of time. If thatch is present, it remains above the soil for a longer period of time and over saturates the plant system. Thatching will help your lawn effectively drain while nurturing its growth.